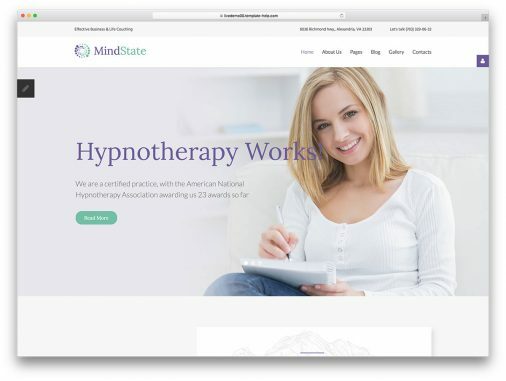 Whether you are expanding your website with an online store or you are building one from the ground up, help yourself with eCommerce website templates. While browsing through all the available items might be a long and tedious process, luckily, we did the work for you. Ain’t we just the best? Instead of jumping from template to template, comparing them against each other, down below, you get only those following the highest standards. It all comes down to your personal preferences, which design suits you and your project best. Other than that, whichever you go with, the final product will be a remarkable eCommerce website. 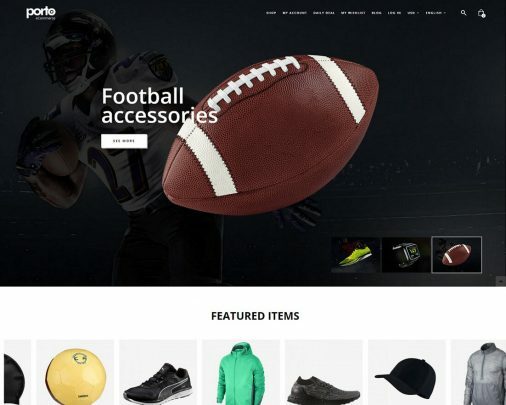 Not only do these eCommerce website templates all sport fantastic looks and fabulous web design, they are also uncomplicated to work with. The templates are super newbie- and developer-friendly. Use them as they come out of the box or edit and improve them per your request. You are treated to a batch of eCommerce website templates with responsive and retina ready layouts and a great deal of unique features. Unlock their full potential and use them to your advantage and extraordinary things will follow. With a solid multi-purpose website template, you can do many things. It is safe to say that you can build nearly any type of page you would like. 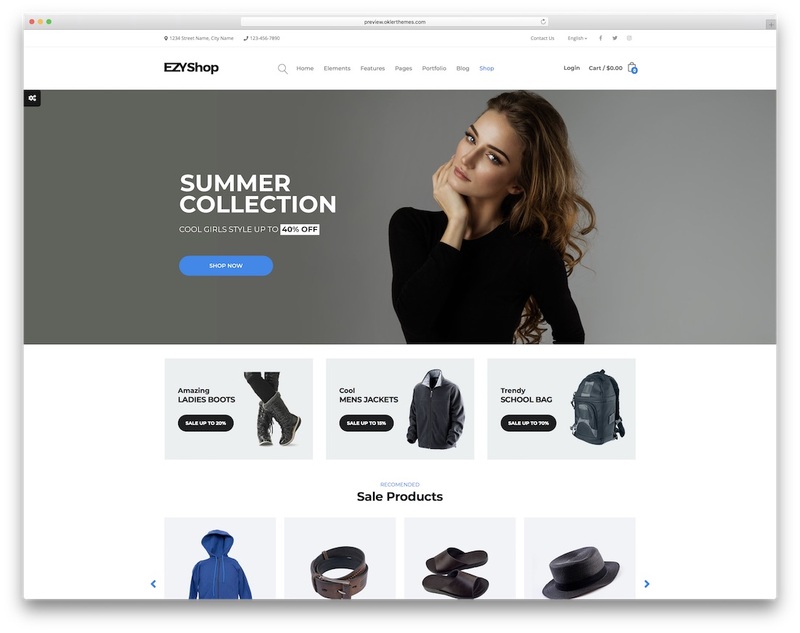 When it comes to EZY and eCommerce websites, the tool is ready and set with three predesigned demos that you can take to your advantage. Selling whatever type of goods is just short moments away with EZY and all its ready-to-use material. Some of the key features of EZY are contemporary and clean design, completely customizable and search engine optimized. The tool is also mobile-ready and fully compatible with all modern web browsers. Regardless of the device and platform they use for online shopping, EZY makes sure to always ensure a stable and fun experience. Get your online business going and start taking fresh orders as soon as possible with the fantastic EZY. 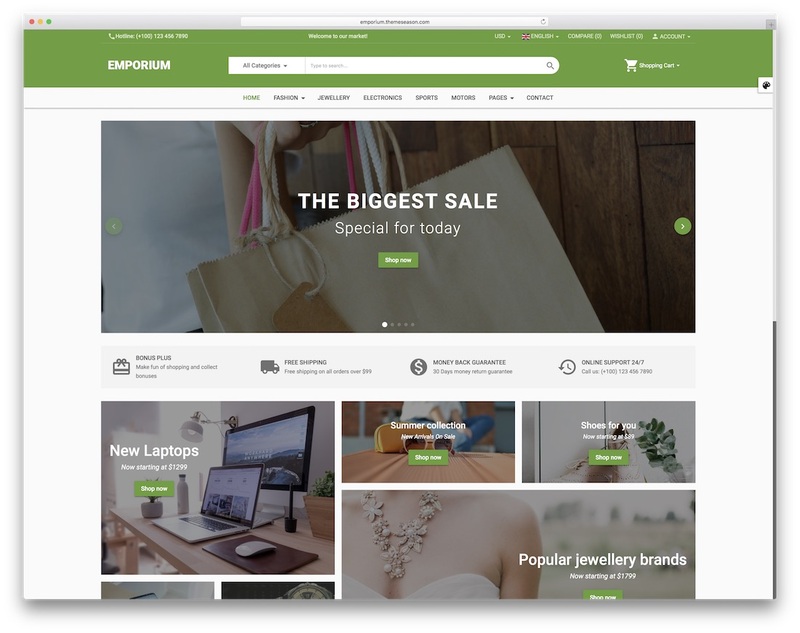 Emporium is a powerful and convenient eCommerce website template that applies to any online store you plan on launching. It is an Angular template that follows Google’s Material Design regulations. It is a site canvas that you will find super simple to use and modify. That said, make sure you get Emporium to follow your initial plan to the T and enrich it with your creative touch for an awe-inspiring shopping experience. With Emporium, you can start selling apparel, accessories, shoes, bags, electronic devices, sports equipment, you name it. The template comes with many handy features like mega menu and multi-level drop-down menu, six color presets, slider, subscription form and Google Maps. As for the contact page, it includes an active contact form so you do not have to build one yourself. Construct your much-wanted online shop and start selling goods today. 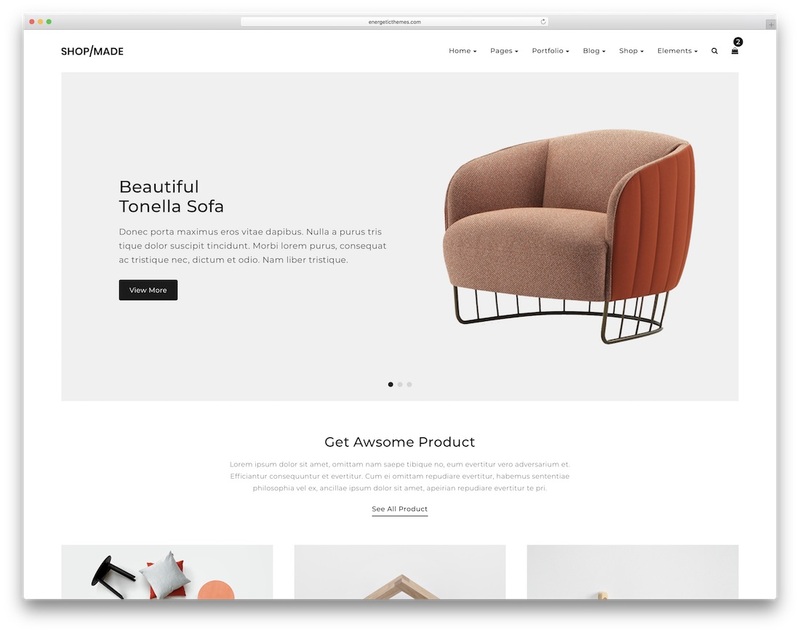 Nephos is a trendy, smart and responsive eCommerce website template that has been handcrafted with care and patience for entrepreneurs and hobbyists. 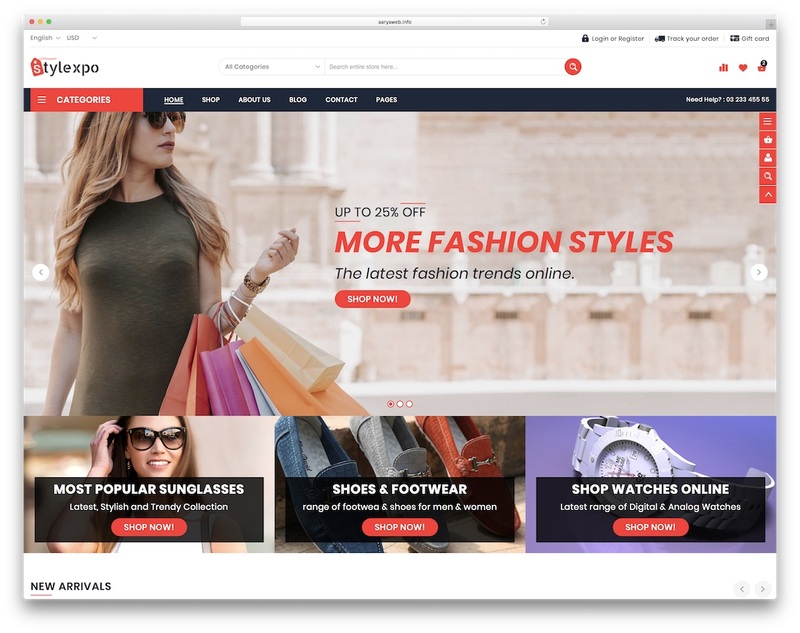 It has a feature-rich interface and unique CSS frameworks based on Flexbox which makes it ideal for crafting outstanding online stores. If you would like to try something different, something that is not Bootstrap, you better consider using Bulma Framework instead. 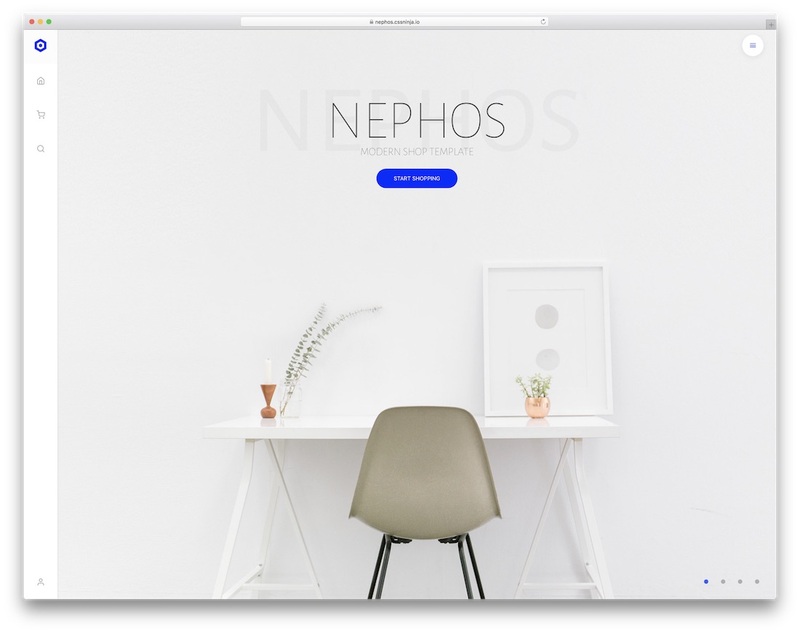 When you go with Nephos as your site foundation, there is no need to have an in-depth knowledge of coding and design. This craking template offers an easy theming system for fast starting and seamless execution. Nephos comes with 22 ready-to-use pages of which two are home pages; one with a slider and the other with a static image. With its highly modifiable variable, you can quickly set Nephos up to fit your business and to provide site visitors a friendly navigation for viewing and purchasing transactions. 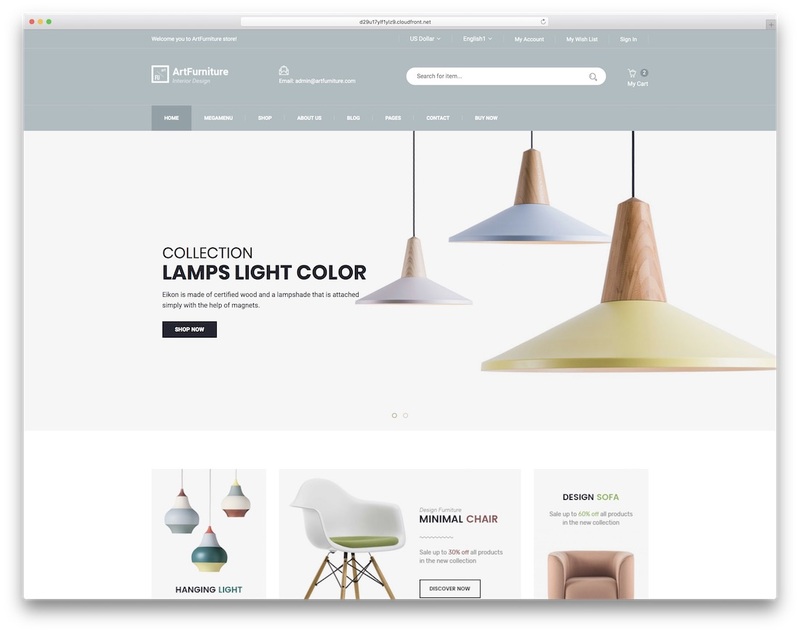 ArtFurniture is one of the finest eCommerce website templates with multiple features and its main focus set on selling furtniture and all that comes along. In short, ArtFurniture can handle any given scenario it is put into. That said, users should not be misled by its name, for apart from showcasing furniture, this particular template also suits electonics, sports, fashion, technology and other in-demand niches. ArtFurniture’s wide range of options and use are hinged on its unique and mobile-ready layout that is also complemented by numerous customizable segments. In the same manner, despite being primarily used for business websites, ArtFurniture allows a user to utilize it for blog or personal portfolio while maintaining a professional look. ArtFurniture comes with four neat home styles and many other internal pages and a whopping selection of features and assets. Do something special and out of this world with ArtFurniture. There are no limitations when you get your hands on Stylexpo multi-purpose eCommerce website template. All this means is that you can do things your way easily and have a high performing page up and ready to go live in a breeze. Stylexpo delivers loads of material for you to put to use, edit and even improve and enhance. There is no need to stick with the initial web design of the template when it offers you quick and straightforward customization. Choose from three predesigned demos, various header styles and a total of over 55 HTML pages. Stylexpo also sports a newsletter pop-up, amazing and comfortable to use mega menu, a functional PHP contact form and a product timer. On top of that, Stylexpo is responsive and compatible with multiple web browsers to ensure a stable and fluid layout that works with all devices intactly. Are you ready to build a spectacular online store that will engage your visitors and drive in even more traffic? I know, right, that should not even be a question. Achieve this goal with style by choosing Meblya. 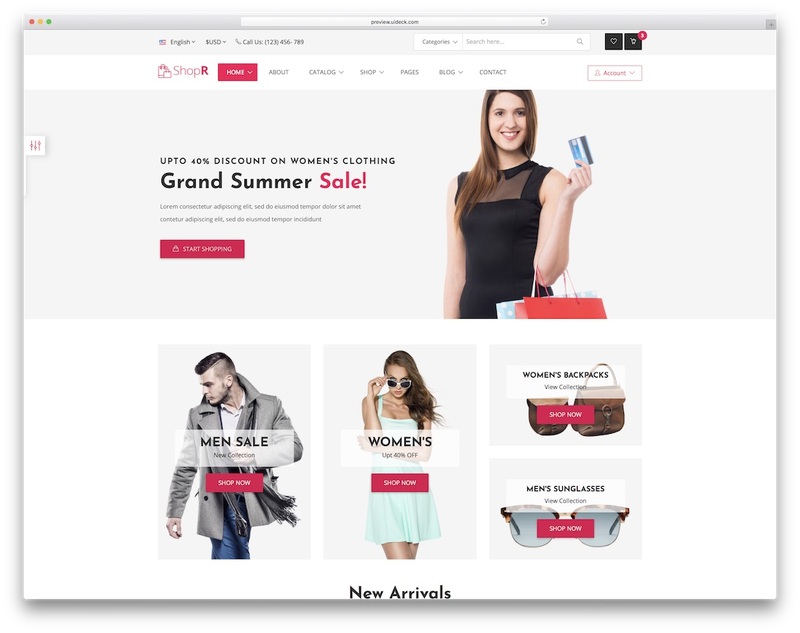 This eCommerce website template works for any field under the sun, but it is ideal for apparel and handicraft stores. Every Meblya website looks clean and uncluttered, instilled with a timeless design thanks to the latest technology. Additionally, the ready-made layouts are responsive and functional, so expect the site to load fast and look great on any device. Other core features include SVG icons, BEM syntax, blog section, animations and many more. Keep the money rolling with the online store you are about to bring to reality with Meblya. Start investigating the 24 included HTML files and mix and match them with your must-own items. The mobile and SEO-friendly Gemma is here to assist you in enhancing your online presence. What makes this eCommerce website template the cut among the rest is the fact that it rocks a ton of goodies and features that will benefit you greatly. Whether you are a beginner or a pro in web development, you can trust this template for its functions. Four main home layouts are ready and set for you to employ and start fine-tuning your own web space. Expediently add files that you desire to commence your site building process. Integrate online selling elements to your heart’s content and personalize the experience. The best part is Gemma offers you more than what has been stated here. Just try it for yourself and discover its wonders. But first, take a peek at Gemma’s live preview page and let it blow you away. Gone are the days when creating a website involved a tremendous amount of dull work. Flone offers groundbreaking web design, certifying you a stunning website without the hassle. Intuitive and adaptive, this eCommerce website template is truly a flexible tool for entrepreneurs, creatives and marketers. Choose from Flone’s extensive variety of exceptional ten home pages, all looking contemporary and classy. In addition to that, you can also customize the look of each demo however you dig it best. Flone’s library also includes internal pages, mega menu, headers, footers and so much more. Surely responsive, you can access your website on all devices, as well as web browsers. Outstanding user experience is guaranteed as everyone can enjoy browsing your content seamlessly. That is worth noting, isn’t it? Why not try Flone to see it in action and take your online business idea to an entirely new degree? 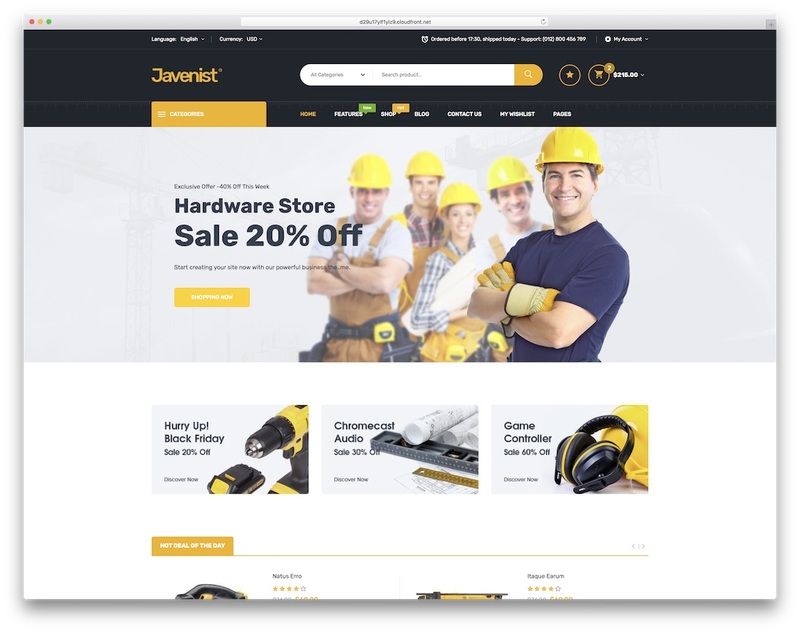 For those entrepreneurs and individuals in search for a flexible, comprehensive and amazingly responsive eCommerce website template, Javenist is ready for download. As a multi-concept tool, Javenist is suitable for selling niche items including but not limited to clothing, accessories, fashion, technology and the like. What makes Javenist different from other eCommerce templates is that it has a visually and graphically cohesive presentation in the form of remarkable ready-to-use home demos. In the kit, you will get seven different index page layouts, as well as other inner sections with a blog and contact page being part of the bundle. It is definitely worth the mention that Javenist is compatible with major browsers and all mobile and desktop devices. It instantly and automatically readjusts to the gadget the shopper uses for browsing and purchasing items. No need to keep postponing the establishment of your online shop with a tool like Javenist. 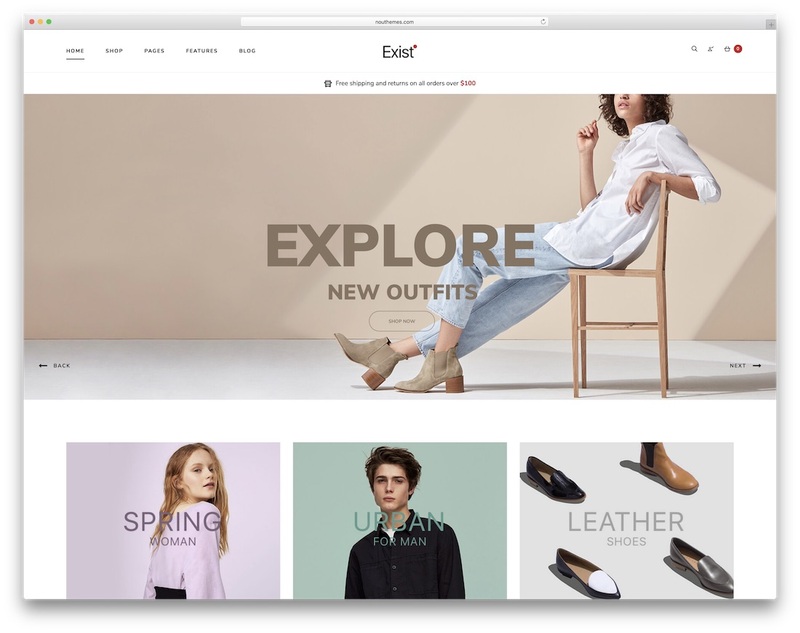 For online fashion stores exclusively, Exist is the eCommerce website template that will do your project well. It is beautiful, pretty, elegant, trendy, professional and simple to use, exactly what you need. 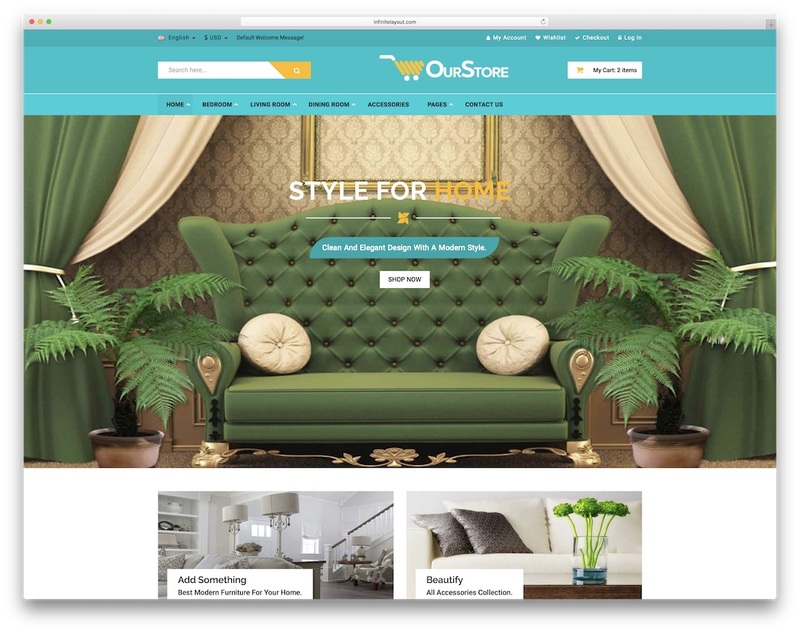 With the twelve predefined home styles, you will quickly pick the right look for your web shop and get busy editing it with your content and details. Go with the out of the box version for the fastest site building process or take one extra step and adjust it to your likings. Unlimited headers and navigation looks and footers, compelling product pages, live customizer, optimized for fast loading speed and search engines, Exist makes your web space a killer one. Exist also includes blog and portfolio pages, as well as two different styles of contact sections. And to capture all your shoppers’ emails, a newsletter pop-up comes part of the deal. 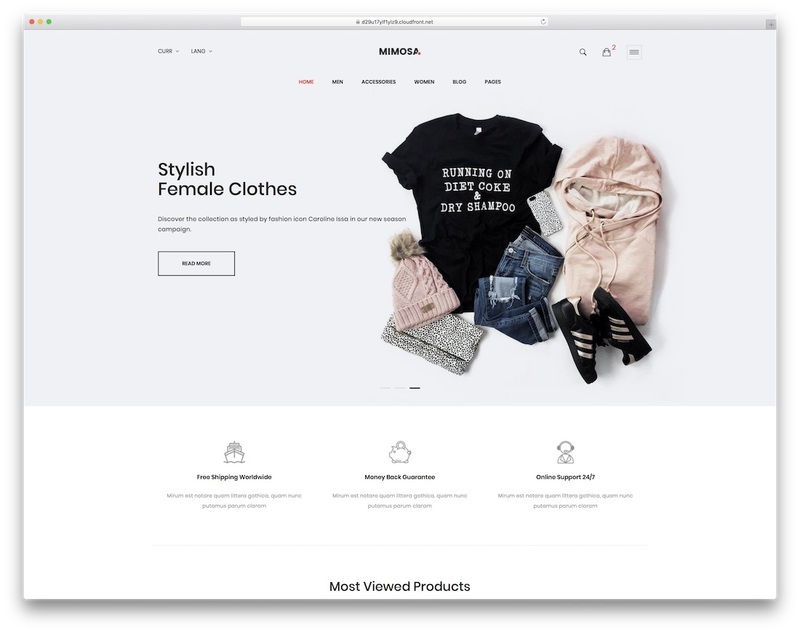 Regardless of being advertised mainly as a fashion eCommerce website template, you can also use Mimosa for other interests. It is versatile enough to quickly adapt to other niches without a problem. Mimosa rocks a unique, minimal and gorgeous design that is incredibly flexible and customizable. Meaning, add your personal and artistic touch to it and adjust the look of it however it best fits your online store. After all, Mimosa is capable of managing various types of websites, from something more personal to a sophisticated business solution. Some of the valuable features of Mimosa are smooth animations, browser compatibility, a code that is search engine friendly and one blog style. You receive six different index pages and additional eighteen internal pages. For something that offers a minimal, clean and distraction-free experience, Mimosa is your best bet. Get it to do things your way and have your complete web presence under control. Whether you are after creating a general eCommerce marketplace selling a ton of different products or you would like to start something more niche, eMarket is ready for both options. This fantastic tool comes with four home page schemes and an additional RTL version for you to kick off your project quickly and efficiently. Of course, each layout that you find in the bundle is also fully mobile ready for the modern mobile online shopper. Speaking of which, eMarket has three entirely mobile-first layouts in the package, too. eMarket is built with Sass and powered by the popular Twitter grid system, Bootstrap. It practices all the latest web and tech regulations to make sure your page works seamlessly all the time. Mega menu, multiple product layouts, product quick view and even PSD files, yes, this is all eMarket delivers for you to utilize. 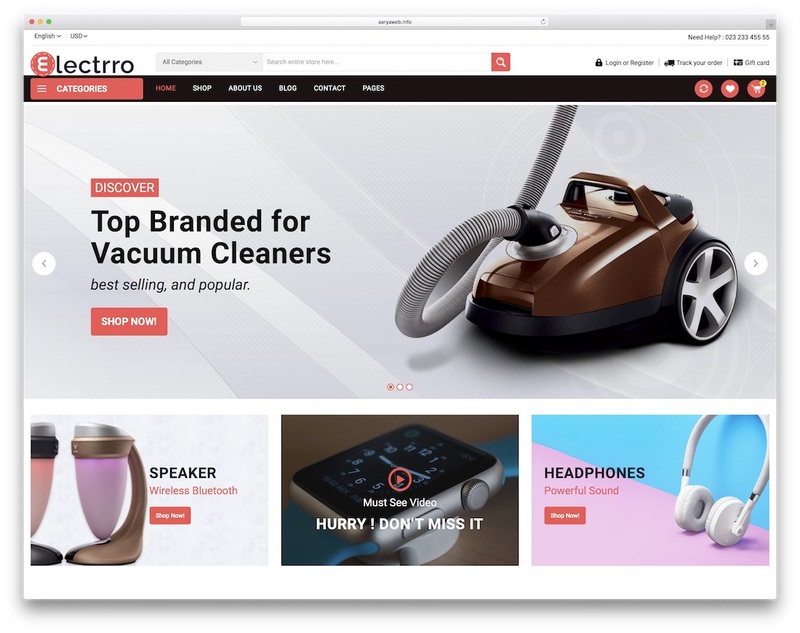 Sure, Electrro is an eCommerce website template that was originally built with online electronic and gadget stores in mind but not limited to. In fact, you can use Electrro however you want since it smoothly and instantly adapts to your online business and makes it shine online. Start your web store today with Electrro and entice shoppers with a modern, clean and sophisticated web design. There is no need for you to hammer out a page from the ground up, it is the included and predesigned material that will do the job for you. Electrro has five different home styles for you to find what suits your needs swiftly. Sidebar, full width, boxed, left and right sidebar and an additional wide layout are the ones you get. Besides, Electrro is entirely customizable for you to tweak it to the remarkable online store business you plan to start. Each Electrro users also gets free lifetime updates so the design keeps staying fresh for years to come. 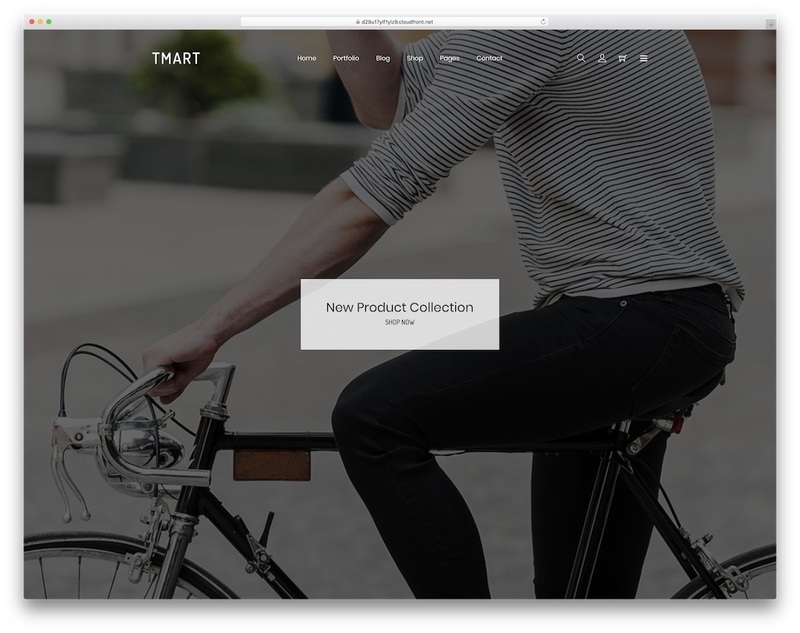 Tmart fits loads of requirements you may have since it is a smooth, elegant and minimal eCommerce website template with a vast capacity. The simplistic look of Tmart can easily adapt to your project needs while keeping the professional look intact. Along with the stunning appearance, other features that make this template highly sought are its responsiveness, flexibility and top-notch performance. No doubt, Tmart is your best partner, if you are looking to show-off the fantastic items you would like to sell in an extremely stylish and advanced presentation. Tmart is packed with a total of 83 pages, eleven index pages and eight compelling shop layouts. With premium support and regular updates, webmasters and end users will both definitely have a ton of fun. 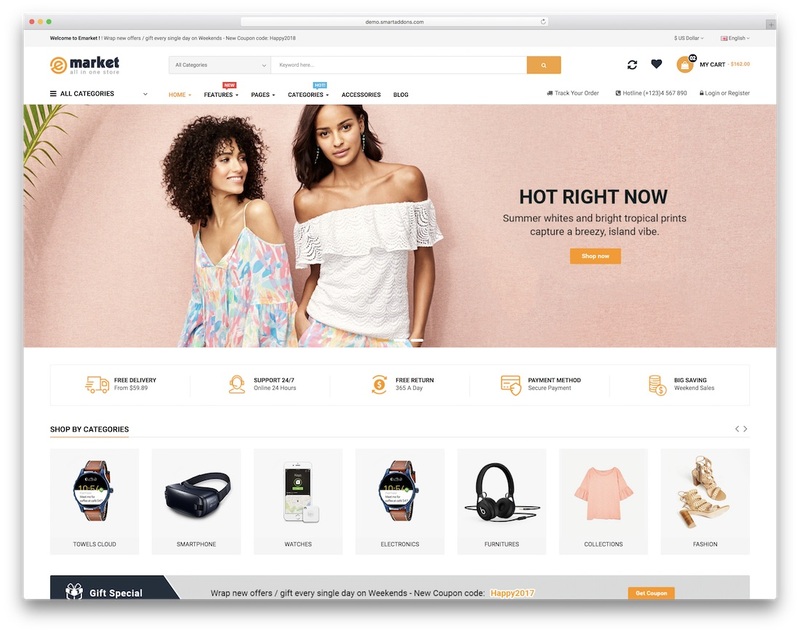 Other practical features of Tmart are comfortable mega menu navigation, Owl carousel slider, testimonials, working contact form and all the rest to the very last detail that you may need for the success of your online shop. Regardless of what you would like to sell and push online, chances are, Shop Made is the right option for you. It is a handy, highly adaptive, contemporary, minimal and trendy eCommerce website template. With many ready-made features and assets, you are closer than ever to successfully launching a neat and tidy web space. Kick things off in style and enter the world of eCommerce with a bang. Grab their attention with your sophistication and see new orders coming in on a regular. Shop Made has six exceptional home page demos which you can utilize exactly as they are or enhance their looks with your personal touch. Other sample content appears in form of catalogs, portfolio pages, about, blog and two live contact pages with Google Maps. 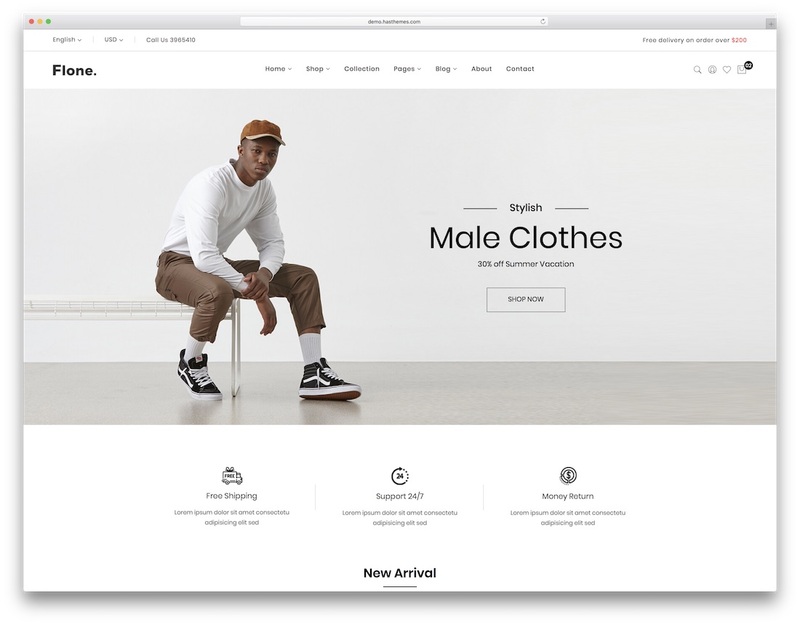 Shop Made features an integrated Instagram feed, newsletter subscription form, social media icons and many different web elements. Start now; tomorrow is a new day. 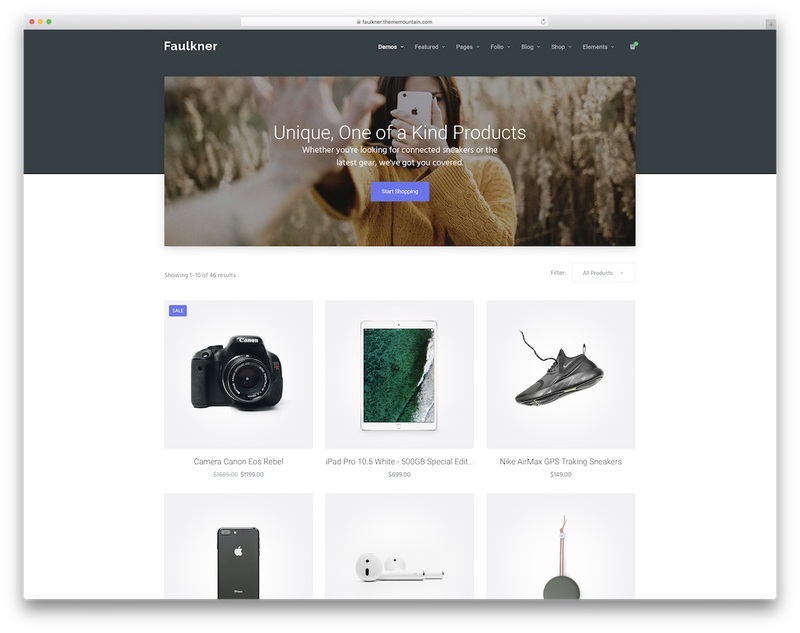 While initially, Faulkner template is for startups and SaaS companies, the item also comes with a fully sorted out online store with a dedicated demo. It has a super simple layout with three different shop looks; two, three and four grid columns. Additionally, you get single product, cart, checkout and confirmations pages of which each comes with various looks. Of course, you can blend together other pages and elements of Faulkner and create the most straightforward online store ever. Testimonials, sticky menu, newsletter subscription box and a clean footer with currency picker, Faulkner is the hidden gem for putting together eCommerce websites. Sometimes, you really need to dig dipper to find the tool that suits your needs. But we already did the digging instead of you. You only need to do a few brave moves and your shop will be live, shining and attracting new customers. You see what we just did there? We went slightly against the grain, starting with eCommerce website templates that are not entirely devoted to online shops. But the next one is. If you are new to Gatcomart template and need to build a mega store, you are in for a sweet treat. 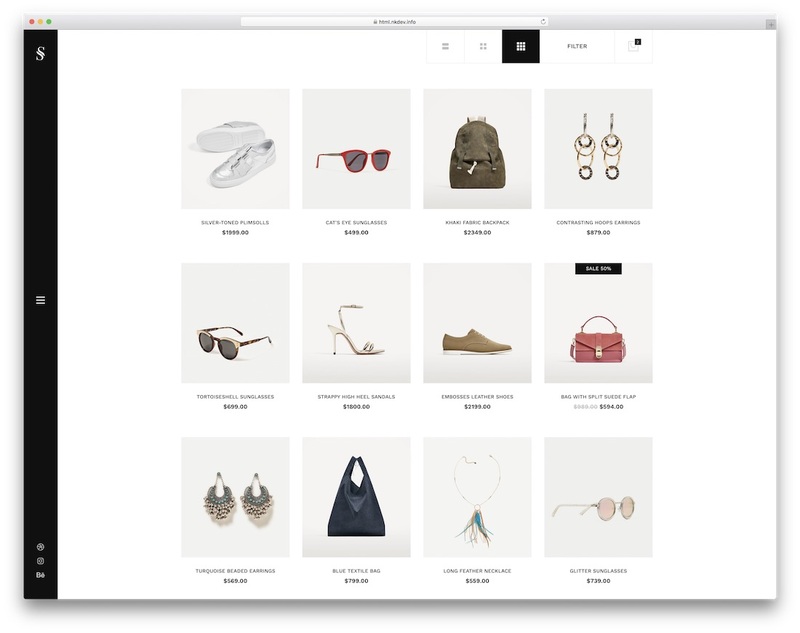 The tool might just be everything you ever wanted a template for eCommerce platforms to be. Packed with front and inner page demos, lots of features and full flexibility to adapt to any niche and industry. 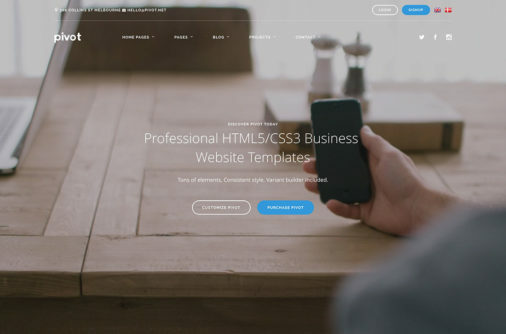 Gatcomart is a Bootstrap website template with organized and commented HTML and CSS files. 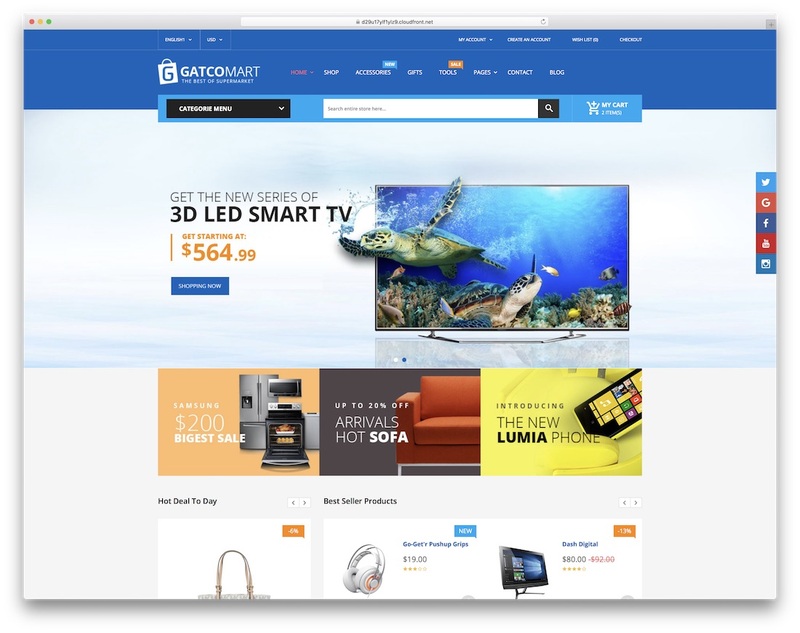 Using, editing and maintaining a website with Gatcomart template will be manageable and undemanding. Even for complete beginners, Gatcomart is a friendly template to transform you into a pro. Creativity and originality are part of the deal if you go with Skylith multipurpose website template. Due to being multi, you know an eCommerce solution is there, at your service ready to turn your idea into reality as quickly as possible. Amongst over thirty demos, one is the minimal shop layout that is exactly what it says it is. It is simple and plain but in a very original way. You do not see shops like these on the internet very often. That said, feel free to use the layout and set yourself apart from the crowd. Skylith’s primary focus are your products and a distraction-free experience browsing and purchasing your items. Visitors will greatly benefit from your website and enjoy checking it on mobile and desktop devices. We could say that Skylith has a very Scandinavian touch to it. A multi-functional template with a customer dashboard that allows you selling just about anything online, that is MartPlace. 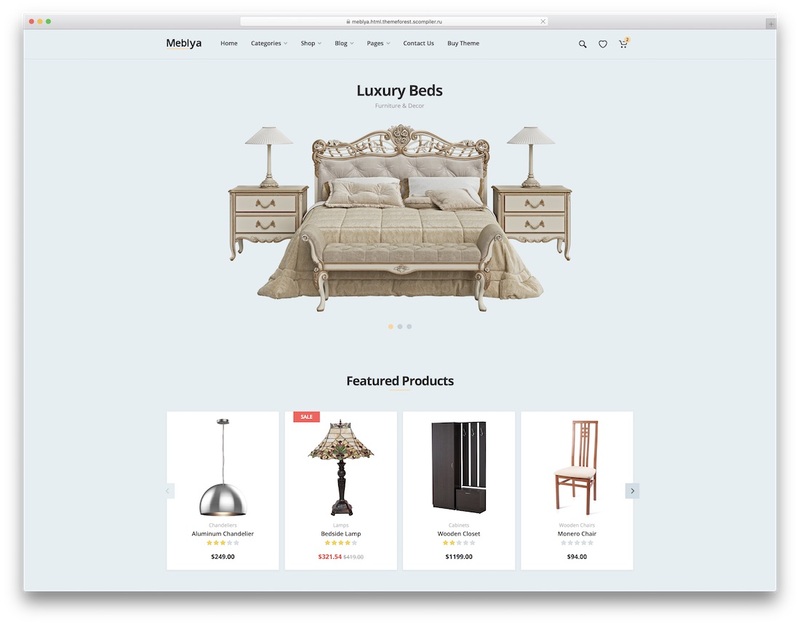 This could be the last eCommerce website template that you ever need in your lives. One tool to create tens if not hundreds of different online shops and marketplaces. Thanks to over eighty pages and seventy UI components and elements. MartPlace has a modular layout what makes it easy to customize and ready to take even the most demanding challenges. 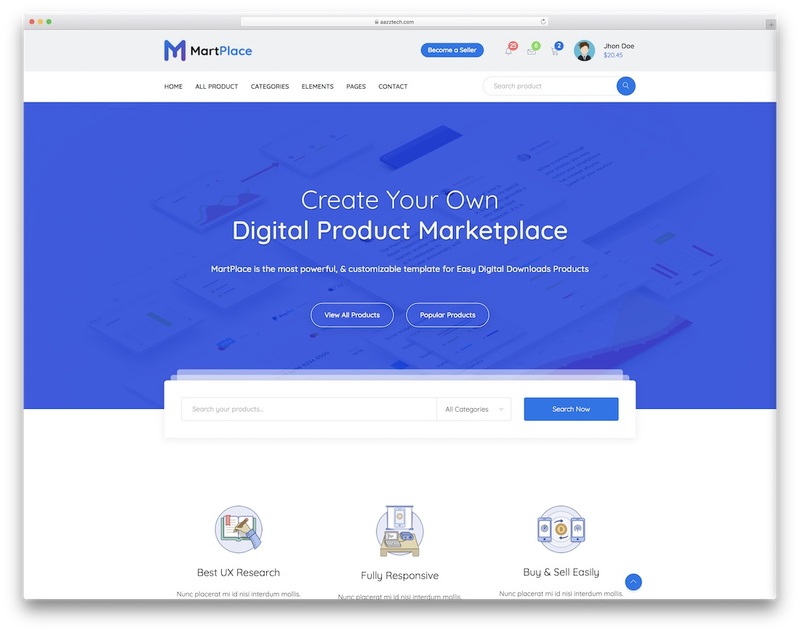 Different product views and product pages, more than seven headers and footers and stacks of features, MartPlace provides way more than you require. Fantastic dashboard, profile area for customers and vendors, you see, the list goes on and on. The most fun you will have when you check MartPlace live in action. Depending on what type of online store you plan to launch, what products you plan to sell, the design matters a whole bunch. However, if you are unsure what path is the safest, the answer is here. The minimal path is always the best option to start with. 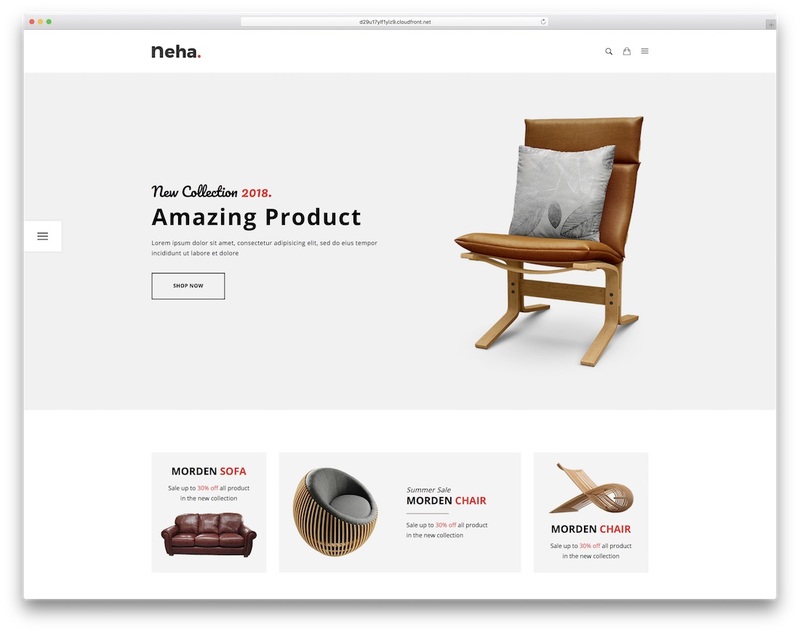 And one of the eCommerce website templates that will help you build divine web stores is Neha. Several front page variations plus a good deal of shop and product detail layouts will do you exceptionally well. With the neat and fluid look that Neha treats you with, you can develop almost any type of online store. But use what is already at your disposal and put together furniture, electronics, fashion, food, jewelry or kids online shop. You do not have to go to Switzerland to get a taste of it. Basel template might not really be a tour guide, however, it will guide you in turning your idea into reality. At least when it comes to making an online store. 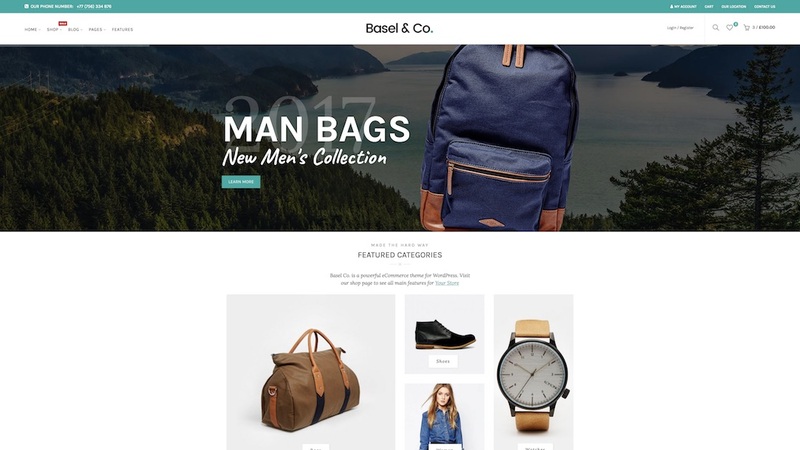 Basel is a Bootstrap 4 website template for all types of eCommerce projects. Cosmetics, watches, lingerie, just about whatever kind of internet store, you can create with Basel. Ten homes are already there anyway so you might just found the exact tool that perfectly suits your requirements. And the best part is that you do not really need to do much work. How cool is that? Pick what Basel professional eCommerce website template offers you and start filling it with your products. The time of the big launch mostly depends on how big your store will be. In other words, how many products you plan to sell. 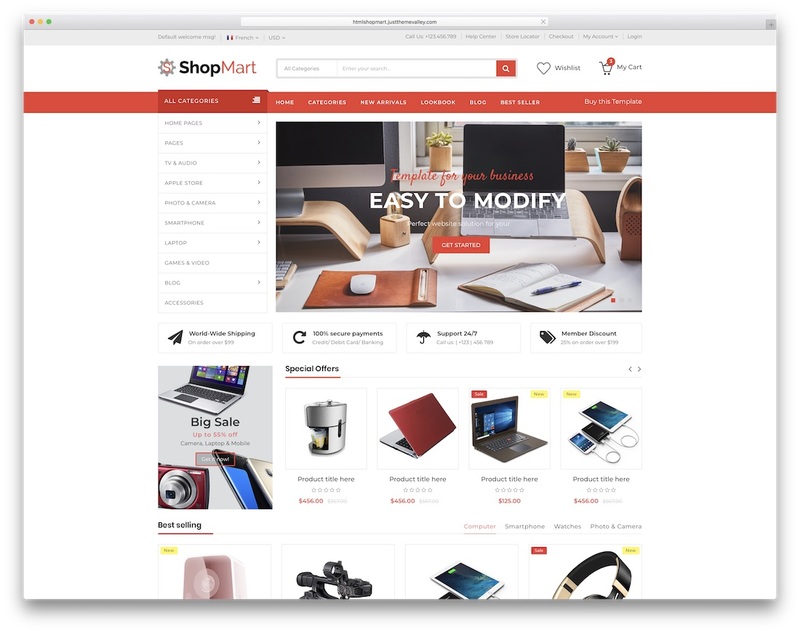 ShopMart is a specialized eCommerce website template for electronic and digital online stores. The features the template has in store for you are vast and valuable. Not only that, extremely handy and comfortable to use, too. What all this means is that setting yourself up with a professional and eye-catching online shop will be an easy task that you will complete shortly. ShopMart comes with four standard and two RTL home versions but in total, in the package, you will find over one hundred pages. In other words, there is a predefined page for every section of your popular forthcoming webstore. To list some of the ShopMart features, please read along. Vertical mega menu, cloud zoom, slider for brands you carry, as well as product, list or grid views and so forth. 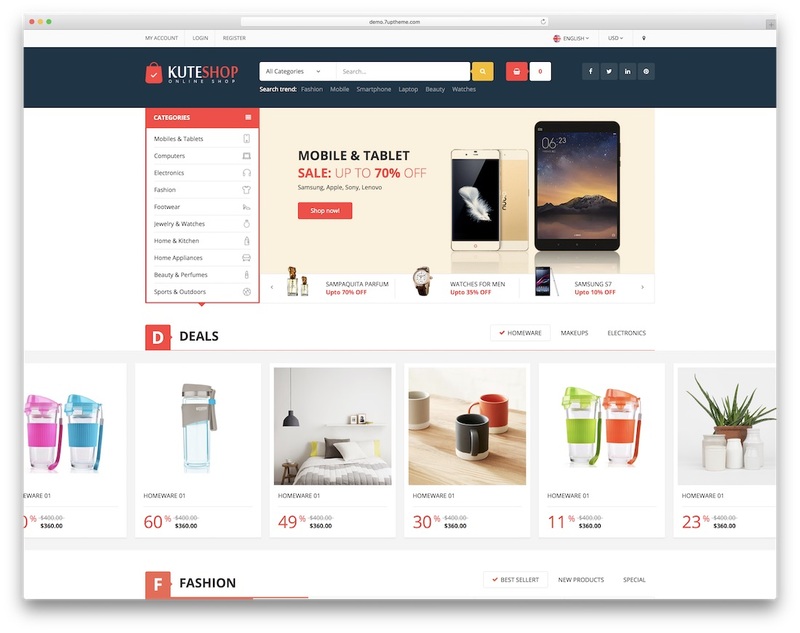 KuteShop is a modern and multi-purpose eCommerce website template with an endless amount of possibilities. Only with the nineteen demo layouts, you can do loads for your online project. But it is the customization and all the extra features what help you refine the design of KuteShop to your likings. Your web store is closer than ever to the realization, just stick with what you dig and you already won. While it sounds super simple, it actually is that uncomplicated. Besides the ready-to-use material, KuteShop is optimized for performance, search engines and browsers. Your stores will be responsive, working flawlessly on any device. Different product and category pages, RTL ready, top and vertical mega menu and handy documentation, you are fully prepared with KuteShop. Yes, Uniqlo template is exactly what you think it is. 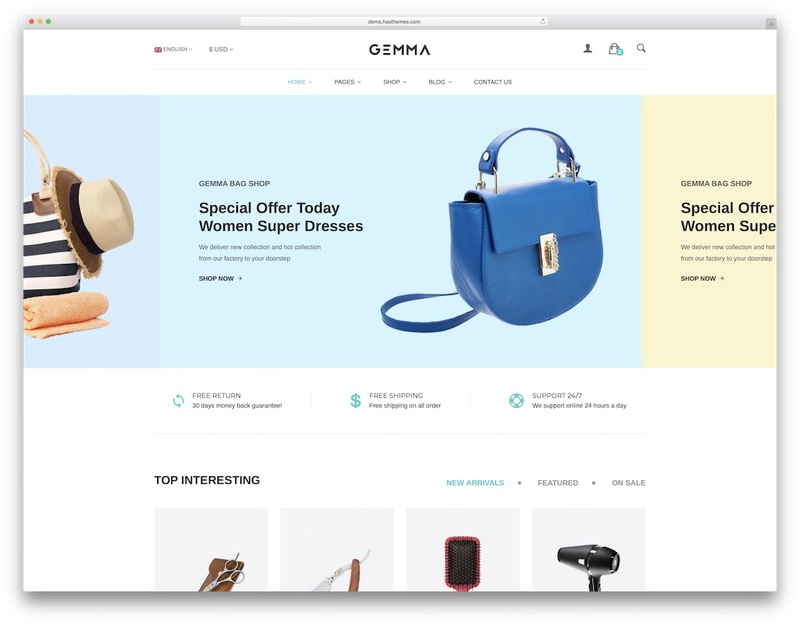 It is a unique and minimal eCommerce template for constructing stores like no other. It will feel very glamorous and opulent if you choose Uniqlo to build an online store with it. You can already see how it looks like by checking out seven samples in the preview. Indeed, all these previews you get in the Uniqlo package. And you do not even need to do any modifying regarding the design. If one of the seven suits you, use it as it comes out of the box. Or enrich it with your personal touch and individualize Uniqlo. Due to Uniqlo’s clean and stylish design, it is best for all types of fashion and accessories stores, furniture, sports, music equipment and tools. But truly, use Uniqlo for whatever online shop you would like to launch. The plain and basic style might suit your idea just best. Are electronics and gadgets your passion? Do you want to create a business around your passion but you just do not know how to execute it correctly? 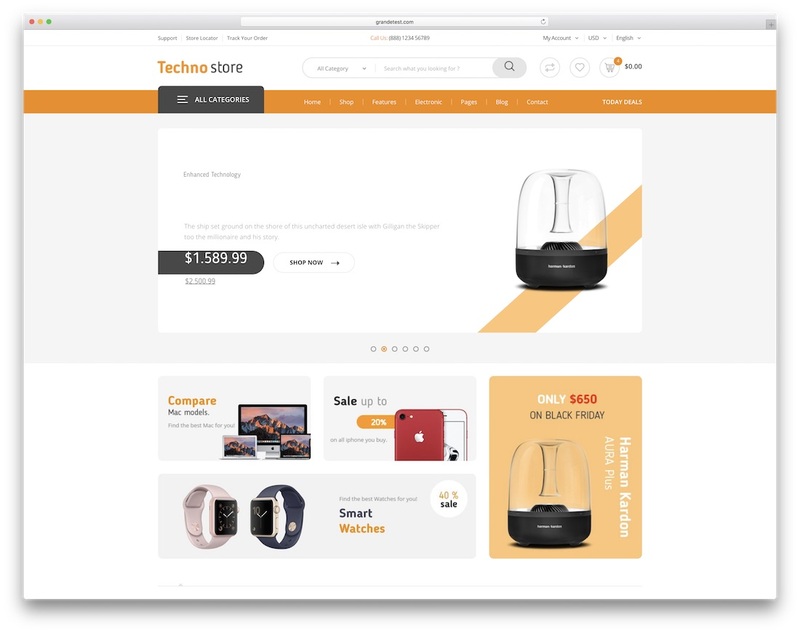 While we will not structure a business plan here, we still will sort out your website’s design with Techno Store electronics eCommerce website template. Or any other item you find in this collection that feels right for you. Techno Store is an online store template of the highest standards. In the bundle, the template treats you with 43 HTML files of which ten are first pages. 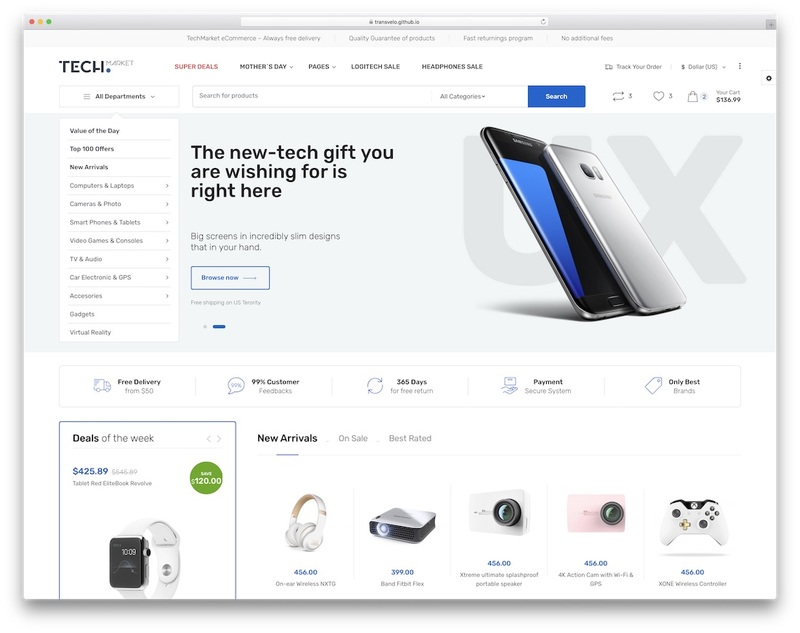 In addition, Techno Store also has shop cart and checkout, compare and wishlist pages, store locator and all other elements that a successful eCommerce platform needs. By using Techmarket template for your eCommerce website, any kind, you save plenty of time and effort. It is a robust and powerful tool for bringing into being online stores for fashion, electronics, tools, furniture, organic, etc. For a small investment, you get a premium eCommerce website template with a great deal of features. From a ton of front page variations and eCommerce pages to various blog and single product styles, Techmarket is ready for every user. On top of that, six color presets are at your service. Chances are, you will find the right combination of everything straight away. However, you can, at any time, do custom improvements through Sass and personalize the web design. Go ahead, be as creative as you would like and stand out from the crowd. Knowing that a template is based on Bootstrap Framework tells you a lot. It is easy to work with, flexible and 100% responsive and mobile-friendly. That is something you do not have to worry about since all the eCommerce website templates from this list follow latest web trends and technologies. OurStore multi-functional template is no different. First and foremost, yes, no matter how niche your online shop might be, OurStore is ready for it. Second, the layouts and design are already there. Third, HTML and CSS files are organized, commented and easy to customize. Voila, that is, roughly said, everything you need. OurStore has six homes and six colors, three headers and three footers, other must-have pages, popup newsletter and sports product quick view. Massive slider, handy mega menu and other fancy features will keep you ahead of the competition. ShopR makes shoppers happy. Especially when you combine it with your must-have products. It is an up-to-date eCommerce website template using cutting-edge web technologies. Not only will you enjoy creating a fully working online store with it, your visitors will turn into loyal customers in an instant. With little work and the right tools, you can have an e-store set up super fast. It is wise to take shortcuts from time to time so you can rather focus on building and growing your business. When it comes to websites, there is no reason to do it from the ground up. Just use a template like ShopR and the job is nearly completed. Marketplaces and online niche shops, they are all highly realizable with ShopR HTML template. Elegant design and a big assortment of features, ShopR is one not to miss. Do you plan on selling apparel, tools, cosmetics, gadgets, lingerie or a mix of everything? 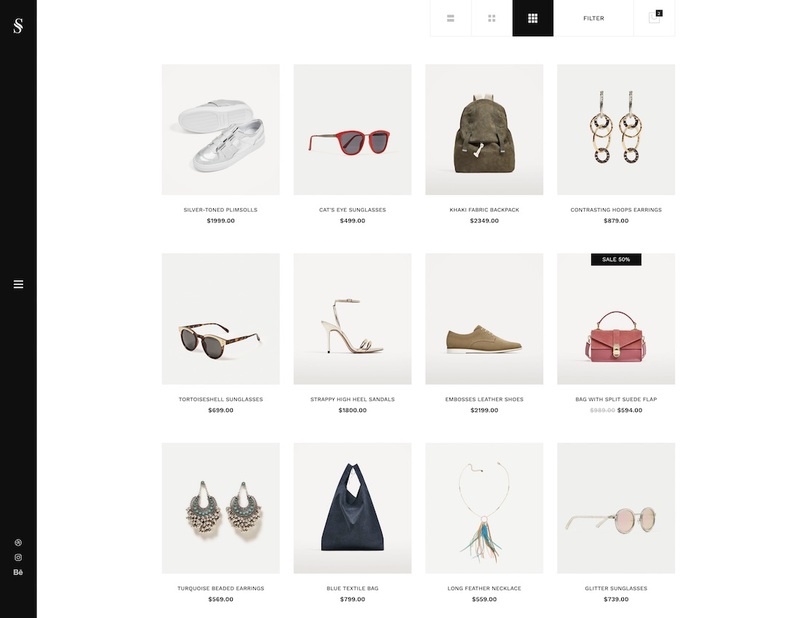 Get things going with eCommerce website templates that we hand-collected for you. Whoever came this far, we still have a few more for you and your businesses. This next one is a multi-concept eCommerce HTML template with a contemporary web design. Eshoper is the one I am talking about. It uses Bootstrap Framework and a valid HTML code as a basis to be as valuable as possible. Eshoper is a simple-to-work-with template, easy to modify and edit. Besides, the end product will be an unforgettable online shopping experience for mobile and desktop users. It uses Google Fonts, has integrated Google Maps, mega menu and a working contact form. Eshoper does not miss a thing. Just a response to your question “Ain’t we just the best?”. Boyyy! are you guys just marvelously amazing or wah!!!! Giving it our best and then some for your convenience. Thank You for Adding Our BASEL template in your Collection, We are honored to be listed in this.